Today there is an abundance of platforms that will help you start your blog with minimal effort but, is it worth your time? In today’s article, we will look at the reasons why you should blog and why you should self host your blog using your very own platform. I will share with you why self-hosting your blog is the way to go if you want to reap the full benefits of blogging. If you’re an avid user of the internet, then you may have noticed that there is a blog for just about any topic. If you are looking to start a blog then. Given the many concerns of today’s world around privacy, I’d highly recommend self-hosting your blog as opposed to signing up for a free blog account. There are many blogging platforms out there such as Blogger, WordPress (dot com), Medium, and Tumblr. While these platforms are generally free and may be more accessible to start – they may cost you a lot more time in the long run. What does it mean to have a self hosted WordPress blog? Self-hosting is when you set up your blog under your domain name and your hosting account with a web hosting company. There are many types of hosting accounts but, generally, most first-time blog owners sign up for shared-hosting accounts. A web hosting account is renting space on a particular server that allows you to show your website the Internet. You have full control over this space, and, unlike renting in the physical world, you are not locked-in to long contracts. This is the opposite of how many people set up their blogs: they sign up on a blogging platform such as Blogger or WordPress.com, pick a name and off they go. There’s a little more set up involved when you self-host, but as we’ll see here, it’s well worth it in the long run. So, why then would you want to self-host your blog? Well, keep reading to learn why. For a moment, let’s think about the concept of renting vs. buying a house. The prevailing wisdom is to buy a house so you can build equity on the home and have something to show for it down the road. If you merely rent year after year, then you are not producing any ownership. Work you have done to the place you are renting goes away when you move to another location. In the same manner, when you self-host, you are building a blog where you are accumulating and capturing value over time. You cannot build value off other platforms the same way you can when using your own self-hosted platform. Can you…? You get the point. You can set up your own blog! You do not need to be technically advanced to do so. For a long time, the technical aspects of setting up your own blog were too much for beginners. Back then it made more sense to sign up on one of the many blogging platforms than to go through the hustle of setting up a self-hosted blog. Today there are thousands of tutorials, guides, and posts about how to set up your own blog using a hosting provider. Not to mention hosting companies has made it a breeze to setup WordPress. You can click a few buttons and have your WordPress website up and running — true story. WordPress started as a blogging platform and then made their software available for anyone to make their own and use as they see fit. With just a few clicks you can now self-host your blog with any number of web hosting companies. WordPress not only provides the software to run your blog but also provides countless features mostly for free for you to grow and customize your blog. Having a self-hosted blog means you are in control of every aspect of your blog. You get to decide what domain to use, how you want it to look, the features you want to add and how you want to steer the future of your blog. In contrast, when you’re on a blogging platform, you will inevitably run into limitations. You may not experience it first but, over time you’ll hit limits just when your blog is about to soar. WordPress gives you another great benefit when you self-host your blog and that it the ability to customize the look and feel of your blog. WordPress supports free and paid templates, better known as themes that you can switch out one look for another with ease. As your blog evolves, you get to update the look and feel to match the new theme or needs that you may have. WordPress has a massive community of designers and web developers who are coming up with new themes , so the supply never runs out — cough cough. In contrast, blogging platforms have way fewer template options with even fewer customization’s that you can personalize. If you look at the top blogs on the Internet today, you’ll see one thing that is consistent with all of them and that is their unique brands. Cultivating a unique brand is something you should be doing from the beginning. A self-hosted blog makes it easy for you to set yourself apart and customize aspects of it that help you build a unique brand. Whether you are a freelancer, musician, or a photographer – you can build your blog around your brand. Self-hosting your blog gives you access to free branded emails that you can and should use in communications related to your blog. Using branded emails helps you to look professional and make better connections when reaching out to other professionals or even your audience. Having a branded email as opposed to a @gmail or @yahoo.com, for example, shows that you have put considerable effort into what you are doing and you’re serious about it. Having a self-hosted blog allows you to have access to the essential analytical numbers about how your blog is performing. By this, I mean website visits, which articles are performing better with your audience, time on site, among other pieces of data. This information is vital because it shows you what is working for you and where you need to improve. Blogging platforms on the other hand only share with you a little of this data, so you are left guessing your next move. When you self-host your blog, you open yourself to many monetizing options that make blogging very worthwhile. You can connect with ad networks, set up an online store and sell physical or digital goods, or even participate in affiliate marketing. You are free to implement any monetization path you choose because you’re in control of the entire blog. For your blog to succeed, you need traffic coming to your website but, what if something is causing your traffic to drop. When you self- host your blog with WordPress, you can fully control your site and can make tweaks without platform restrictions. If your site is slow, then you can install a caching plugin if you are receiving the WordPress white screen of death then you can log in into your host and resolve the issue. 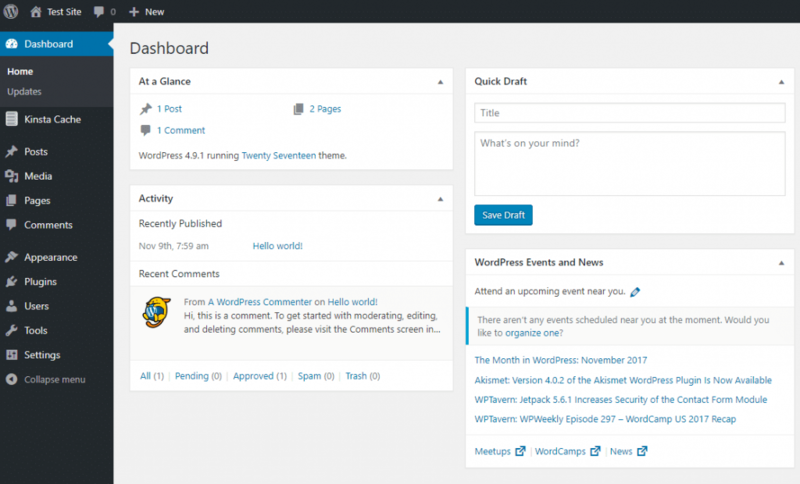 Whether it’s fixing a bug to installing a custom theme, you will have all the flexibility using the self-installed version of WordPress. Lastly, a self-hosted blog helps you set an impression of professionalism. In the Internet world today, professionalism helps build trust with your audience and in a way reassures visitors that you will be here tomorrow and are serious about providing value. You will be rewarded for your professionalism by more engagement from your audience and a following – which all bloggers dream about. In both business and life, people take you for how you present yourself. Why not introduce yourself as a professional with your own blog? After reading this article, it’s easy to see the many ways that a self-hosted blog can help you. If you are on other platforms, you are at the mercy of their will and policies and may find yourself out in the cold when they change their focus. Get started today setting up your blog with your domain so you can control your website. Have any questions regarding starting a blog or about this article? Feel free to drop us a comment, and we will be sure to provide you with an answer.